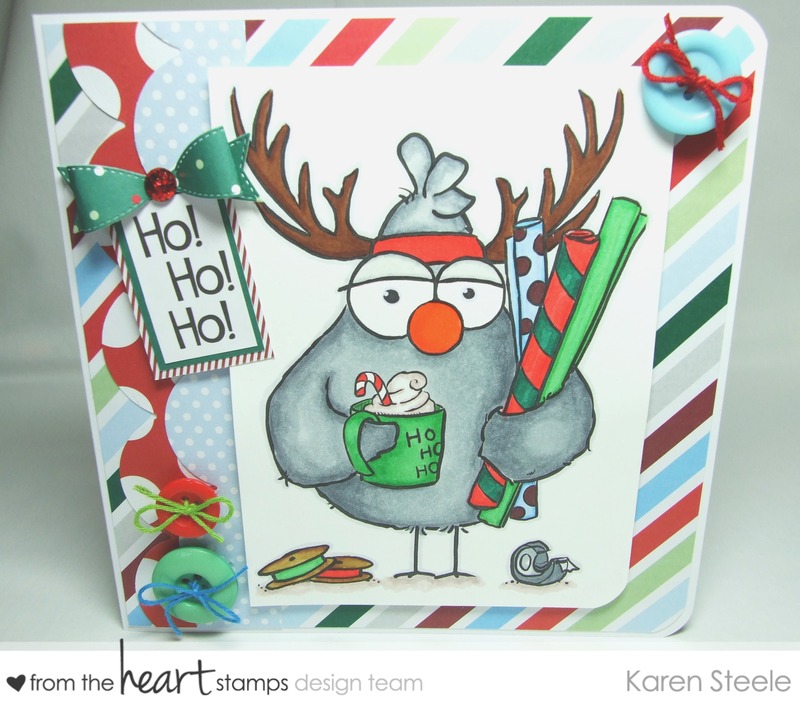 From the Heart Stamps November Blog Hop! Well, it’s the first Friday of the month which means that the design team at From the Heart Stamps are on a hop until Monday! The theme for this month is CAS and Over the Top. Each designer had to pick an image that was to be used on 2 cards – 1 CAS and 1 OTT! I find CAS really difficult to make myself as I always want to add ‘something’ to it although I do love the clean and simple look! The ‘Over the Top’ version needed to have more layers and embellishments etc. As you hop along to see what each designer has created please leave a comment on each blog. One random commenter will be selected on each blog to win an image of choice from the FTHS store! If you have arrived here from the lovely Jo, then you’re in the right place. If not, why not start on the From the Heart Stamps blog so that you don’t miss any fab inspiration. Here are my cards using Christmas Spirit Birdbrain! Supplies I have used to make these cards are: Papermania – Capsule Collection Festive Spots and Stripes, Centura Pearl Card, Sizzix Scallop Border Die, L’il Inker Small Bow Die, WRMK Corner Chomper, X Cut Snowflake Embossing Folder, Buttons, twine, Glossy Accents and Spectrum Noirs to colour. Now head on over to the lovely Kathy’s blog to see what she has created. The hop ends on Monday 9th November 6am EST so don’t forget to leave a comment on each designers blog to be in with a chance to win a fab image from the FTHS store! Winners will be posted on the FTHS blog on Wednesday 11th November. This is another favorite image of mine – but then again, most of them are… 🙂 I am really drawn to the CAS card because the embossing and the thin strips of paper really set off the image as the star of the card. Fabulous Hop Cards Karen!! Great job on the coloring here! You really made the image come to life! Both cards are lovely! Great job on both cards…so colorful! Great job on both cards, Karen! I love the added strips of color on the CAS card. That shimmery embossed background is so pretty! Your OTT card is just plain fun! Love this image and you did a wonderful job with it! I have a perfect idea for using this…thanks to your inspiration! Both cards are fabulous! Love Birdbrain images! Your coloring is fantastic! Great color choices! Never thought to make him a grayish color. I really like it! Both of your cards are so very cute!! LOVE! Both of your cards are so very cute!! LOVE!! I think I need to break down and get one of those bow dies….sooooo cute!! I’m with you…CAS is harder for me but love the look. I do like the paper you used in the OTT one. Both are cute. Adorable cards! I love that Christmas-y look. The over the top card is wonderful with those background stripes. I love the embossing on the CAS. Thanks for the fun blog hop! Stunning cards! Wonderful coloring and matching with background. Both card are really great! Both designs are adorable, Karen. Great coloring of this fun Birdbrain image! Both cards are super sweet, Karen. 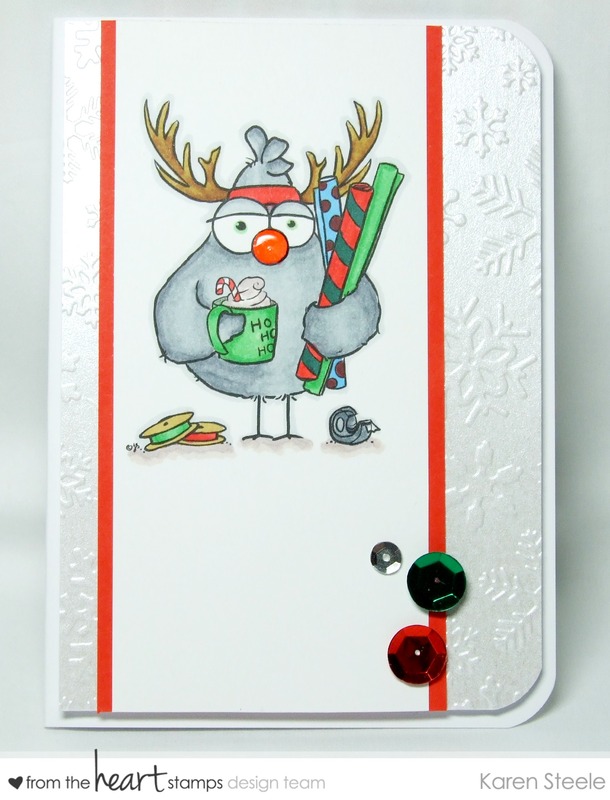 I like the embellishments on the “OTT” card, the little bow and the buttons – great accents. FUN cards Karen. Great embellishments on the OTT and the CAS is so striking. Love the embossing and shimmer as well as the sequins. I never remember to pull those out and they are destined to forever remain a stash item – I will try to remember because it is simple but it adds sooo much!! thanks for the inspiration! I love your cards. Love that you used sequins. Karen, both your cards are fabulously put together!! I love the simplicity of the CAS, embellished with minimal sequins and the subtleness of the embossed snowflake. Love the beautiful buttons and bow on your OTT card. I love the snowflake embossed background and sequins, looks awesome but both cards are fabulous! Both of your cards are just adorable. Both of these are darling, Karen. I really love your coloring. Oh I like these! I might have to CASE your CAS card – gorgeous! The image is super cute! Karen, love both your cards. The CAS card would be great for mass production!